In the name of Christ, the King. Amen. This morning we begin a summer-long series looking at the stories from the books of First and Second Samuel and First and Second Kings in Hebrew scripture. A little bit of background before we begin. The Revised Common Lectionary, the three-year cycle of readings used in worship each Sunday, is a relatively recent creation. Though it was officially released in 1994 and adopted by the ELCA and the majority of other American mainline churches, it had been in use while under development since the mid-1980s. Prior to that, there were other lectionaries, the goal of each being to bring some sense of unity to the wider Christian church by providing common texts for worship, preaching and study across lines of difference in denomination and culture. You could be a Minnesota Lutheran or southern Methodist and still be hearing the same stories in church on any given Sunday. 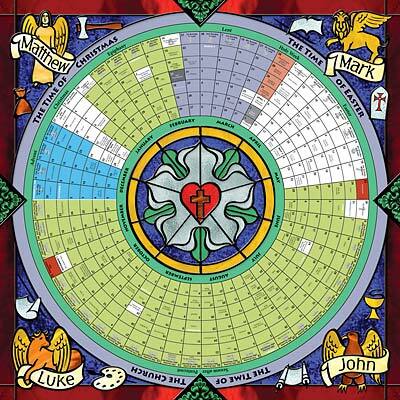 During the second half of the year, the long season known as “Time after Pentecost” or “Ordinary Time,” the Revised Common Lectionary provides two tracks of readings, known as the “thematic” and the “semi-continuous.” In the thematic series, which we have often used at St. Luke’s over the last few years, the readings from the Old Testament are selected to line up thematically with whatever is happening in the Gospel reading. In the semi-continuous series, which we will be using this year through the rest of the summer and part of the fall, the Old Testament readings are not selected with reference to the gospel. Instead, they roughly (or “semi-continuously”) follow a storyline from Hebrew scripture. In Year A (last year) the semi-continuous readings follow the stories from Genesis of Abraham and Sarah through Joseph and his brothers to Moses and the story of the Exodus. In Year C (next year) the semi-continuous readings follow the stories of Elijah and Elisha and the prophets Amos, Hosea, Isaiah and Jeremiah. There are plenty of good reasons why some churches follow the thematic readings and others the semi-continuous readings. Neither is right or wrong. Here are some of the reasons I’m looking forward to working with the stories from Samuel and Kings this summer. Firstly, there is plenty of research to show that the average church-going Christian feels increasingly unfamiliar — and even uncomfortable — with their bible. Since we know each other pretty well here, I’m just going to call for a show of hands. Who here feels absolutely at home in scripture — has a favorite bible filled with notes in the margins, turned down corners and worn-out binding? Alright, now let’s see the rest of you raise your hands. Nothing to be ashamed of here. We’re only the third or fourth generation to have televisions, and it’s only been a couple of century and some decades since electricity started flowing into our homes. For most of recorded history people were illiterate and learned these stories by rote. After the Reformation and the invention of the printing press, the bible was the one book found in almost all Western households and the one children and parents read together. Our reading and viewing habits aren’t odd, they’re just not the norm. So, it’s good to find a way to bring the fullest range of these stories back into shared culture of our congregations. Secondly, when the Old Testament stories are selected as companion pieces to the Gospel a couple of things happen. On the positive side, we learn something about the continuity of God’s justice and God’s grace. The revelation of God in Christ Jesus is seen threaded throughout the whole of Christian scripture and we begin to see the life of Christ stretching backward and forward in time, uniting us with God’s work from creation onwards. On the downside, it can seem as if all of Hebrew scripture gets treated like a footnote to the story of Jesus. We hear snippets of stories, taken out of context, and never hear the Hebrew scriptures on their own terms. This year in particular I think the stories from Samuel and Kings have something to say to us, here in the United States, as we enter the final months of a presidential campaign that will use up millions of dollars in resources and simultaneously focus on issues of national and global importance and divert us from issues of national and global importance. Because the stories from Samuel and Kings are stories about how the people of God went from being people of the Exodus, who knew themselves to be saved and delivered by God’s hand, to people of a nation, who came to put their trust in kings and wars and expensive building projects. These are the stories of Eli and Samuel, Saul and David, Solomon and the divided kingdom. To really understand where this story begins, you would need to read the first seven chapters of First Samuel, which gives us the story I read in brief to the children already this morning of Hannah and her prayers for a child. Like the Gospel of Luke, which begins with the stories of Mary and Elizabeth and their hopes for a new world, the stories of Samuel and Kings begins with a woman named Hannah who is childless. All around her are women with children of their own, women with a secure future. Even her husband’s other wife has children, and mocks Hannah for her barrenness. Hannah prays to God for the new life she desires, and promises to dedicate that child to the service of the Lord. God hears her prayer and she becomes pregnant with Samuel, the prophet who will anoint the first king. Hannah is, in her own right, a figure of faithful Israel at its best. Although those around her seem to have more than she does, Hannah puts her trust in God and dedicates her future to God. Sadly, that’s not how the rest of the nation acts. Eli, the prophet who hears Hannah’s prayers, has two sons who are unfit to judge the nation. When they die, Eli passes that responsibility on to Samuel. Samuel’s sons also prove unfit to judge, and when Israel is threatened by the armies of the Philistines the people give in to their fears. “Appoint for us a king to govern us, like other nations,” they call out. Turning from their faith in God, the people call for a ruler in whom they can place all their trust, on whom they can lay all their expectations. Fearful of what lies beyond their borders, they are willing to give up their power in order to feel safe again. But their eyes wandered, and they began to want what the nations around them had. They wanted prosperity, they wanted security, they wanted freedom from fear. They lost their faith in the God who had delivered them, time and time again. When you examine your deepest desires, what do you find? When you look honestly at your hopes and dreams, what do you see? Which gods rule your heart? The gods of the surrounding nations were appealing for a reason. Dagon, the god of the Philistines, was also the god of corn. For people who relied directly on the land to feed them, the god of corn was hard to ignore. Who do we rely on to feed us? I suppose for some of us it is our parents, for others our jobs. For some it is the government or our neighbors. Do we still think of God as the one who provides for all our needs, or have we begun to trust in other powers to take care of us? Ashtoreth, another Philistine goddess, was believed to control fertility. Among people who relied on their children to support them in the old age, and particularly among women — whose value in a family was often tied directly to their ability to produce children — Ashtoreth, the goddess of fertility, was hard to ignore. Who do we rely on to care for us in our old age? Who do we put our hopes in to redeem our lives with their own? Do we still trust in God to care for and provide for us through all our days and until the end? Do we trust in the holiness of the life God has given us, or are we burdening our children with the responsibility of setting right all that we still regret? Baal-zebub, the lord of flies, is a name that has found a home in all sorts of apocalyptic fiction and supernatural horror films, but has less sinister roots. It wasn’t at all uncommon in the ancient world to name a god for the things it had power over. Flies were a kind of pestilence, a plague that brought illness and death. The Philistines who surrounded and threatened Israel worshipped Baal-zebub, lord of flies, counting on this power to protect them from illness and death. Hard to ignore a god who promises deliverance from death. Trust is constantly beset by fears of all kinds, and we as people seem to have a very low tolerance for fear. We will give up all kinds of power, personal and political, to those who promise to relieve our fears. But at what cost? Essentially, Samuel says, what you put your trust in will rule you. That to which you give your power will use it on you. Freedom from fear is no freedom at all. Instead it is the beginnings of war, the establishment of wealth and poverty. The beginning of nobility is also the beginning of servility. There can be no kings without slaves. No commanders and courtiers without serfs and servants. At this critical juncture in history, the God who delivered Israel from the slavery of Pharaoh in Egypt says to Israel, be careful what you wish for… you just might get it. What, then, is the lesson for us? What do we hope for in this season of king-making? As candidates vie for our allegiance, promising wealth, hope, access to health, and an end to war, who are we putting our trust in? At what cost, to us, comes freedom? At what cost, to the world, comes our freedom? Samuel hears the people’s demands and, having warned them what they’re in for, he agrees to give them what they ask for. The people gather for a coronation of sorts, selecting Saul to be their king, and things are already off to a bad start. Kings, it turns out, come and go. Before long, the people will be selecting a new one. And that’s where we’ll pick up next week.